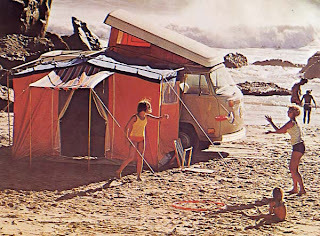 With a 1973 Volkswagen Campmobile, families pulled off the road to enjoy the many splendours of Canada. Question: How many elephants can you put in a Volkswagen Beetle? Answer: Five. Two in the front, two in the back and voila! one more in the glove compartment. 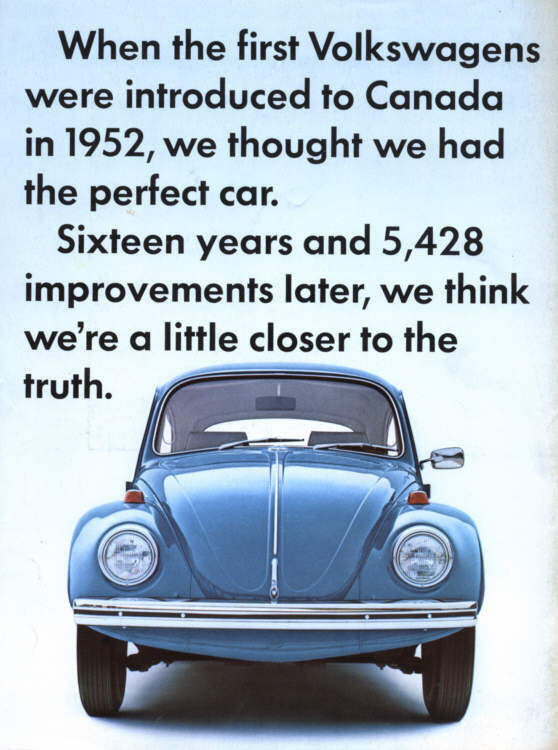 Canadians first saw the Volkswagen Beetle at the 74th annual edition of the CNE on June 10th, 1952. VW jokes were popular and always brought a smile. Canadians told lots of Beetle jokes. The odd-looking passenger car brought chuckles because it resembled a certain hard-shelled insect. 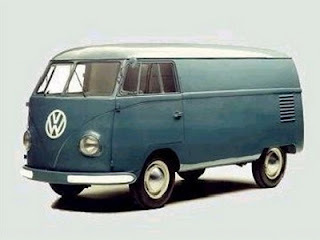 The first Volkswagen Transporter was built on March 8th, 1950. 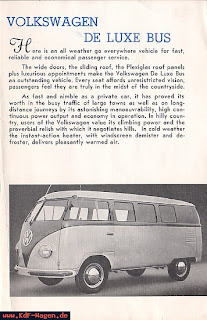 VW was keen to break into the North American market. In studying that market officials noted that Canadians were enamoured with small imports and were particularly fond of Austin and GM's British subsidiary, Vauxhall. Further analysis revealed that consumers in that country were extremely frugal and value oriented in purchasing automobiles. Imports made up a large portion of new car sales in Canada. Volkswagen Canada Limited hung out its shingle in the Dominion on November 9, 1952. Canada was the West German company’s first overseas subsidiary. Sales were modest; the Toronto-based firm sold 94 Beetles by the year's end. 1953 Volkswagen Transporter for Canadians. The following year, the strictly utilitarian truck line was added to the mix on dealers’ showroom floors. A total of 584 Transporters were sold, along with 1,160 passenger cars. The weird looking vehicles with their distinctive air-cooled engines whine quickly won a place in the hearts and driveways of folks in all ten provinces, the 1954 sales totals added up to 2,776 Beetles and 786 Transporters. Those figures simply exploded to 5,881 sedans and 1,509 of the trucks in 1955. Transporters and other Type II vehicles began rolling out the door of the new Hanover factory in 1955. The first of the Volkswagen Campers appeared on this side of the Atlantic in 1957. Canadians had been eager to discover their own country ever since the Trans-Canada Highway united the nation in 1962. The asphalt ribbon stretched more than 7,000 kilometres across the Dominion, from St. John’s to Victoria. 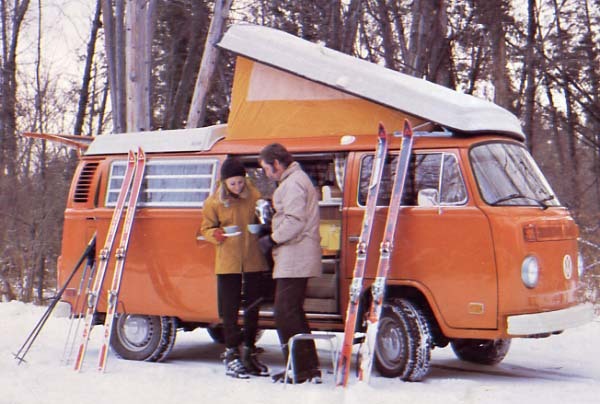 The VW Camper couldn’t have come along at a better time in Canada's history. VW advertising employed wry humour in 1968. Volkswagen Camper sales totalled 626 units in 1969. That figure rose to 787 units in 1970 and nearly doubled to 1,151 in 1971. There was a modest increase in sales as the total reached 1,364 units in 1972. With huge oil reserves in Alberta, there was no OPEC-induced energy crisis in Canada in 1973. Gasoline flowed freely and Campmobile sales soared upward to 1,623 units in 1973. That constituted a 19 percent increase over last year’s sales. 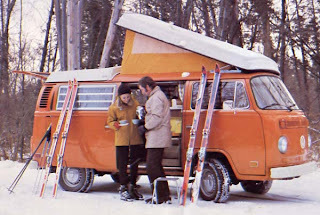 A VW Campmobile was no fair weather friend. A robust gas heater made it the perfect winter camping companion, too. The 1973 version of home-away-from-home was highly a refined package. On its pert 2 400-millimetre (94.5-inch) wheelbase, the motel on wheels rolled along nicely courtesy of a powerful, air-cooled, pancake four-cylinder engine that generated 65 horsepower. Weighing in at 1 495 kilos (3,296 pounds), advertising promised that the Campmobile would deliver 11.3 kilomtres/litre (25 miles to the Imperial gallon of gasoline) when equipped with the fully synchronized four-speed manual gearbox or 8.85 kilomtres/litre (21.8 miles per Imperial gallon) when the VW was mated to the optional automatic transmission. Not that one would want to go that fast; top speed was pegged at 125 kph (78 mph) with the standard gearbox and a comfortable 120 (74 mph) with the automatic transmission. 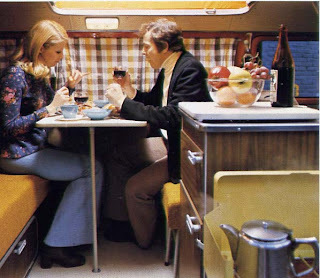 Dinner for two was cozy in a 1973 VW Campmobile. 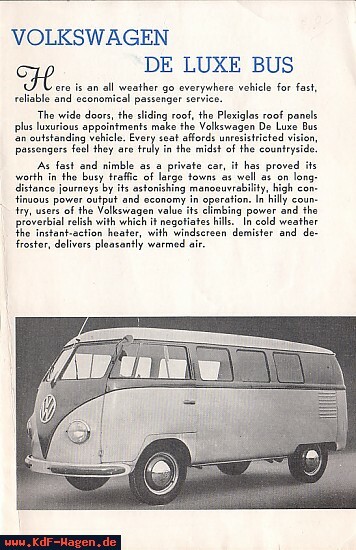 Advertising bragged confidently, “Once you step into a VW Campmobile you may not want to leave.” The rolling home boasted all the comforts of a modern bungalow. It was replete with a stainless steel sink, a 45-litre (1.6-cubic foot) icebox and a two-burner stove; closets galore, storage lockers and cabinets. There were sleep arrangements for two grownups and three kids. The 110-volt electrical system featured a breaker. Its stylish interior was paneled in birch and seats were upholstered in a longwearing, gold fabric. Colour-coordinated curtains-complete with tiebacks and rods-covered all the windows, including the bay windshield. A pop-up top allowed a 165 cm x 55.8 cm (65 inch x22 inch) folding cot to stretch out on the roof and a hammock, strung across the front seats, provided another bed. Bench seats folded neatly and when that surface was added to the space above the engine deck; it created a full-sized bed for two adults. 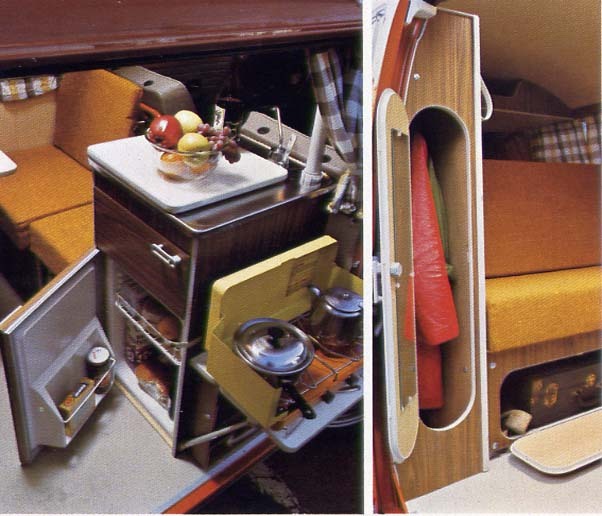 Oodles of cupboards and storage space was a hallmark of the Volkswagen Campmobile. If the family required more space, an extra-cost, lightweight, waterproof poplin tent with vinyl flooring could be had. With poles colour-coded for quick assembly, the completely sealed tent attached tightly to the drip rail of the vehicle or it could stand independently. 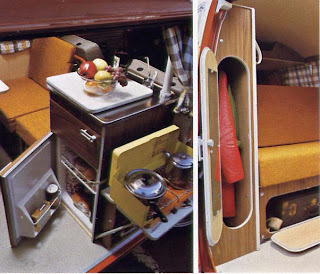 An auxiliary gas heater kept the cabin toasty warm during winter outings. 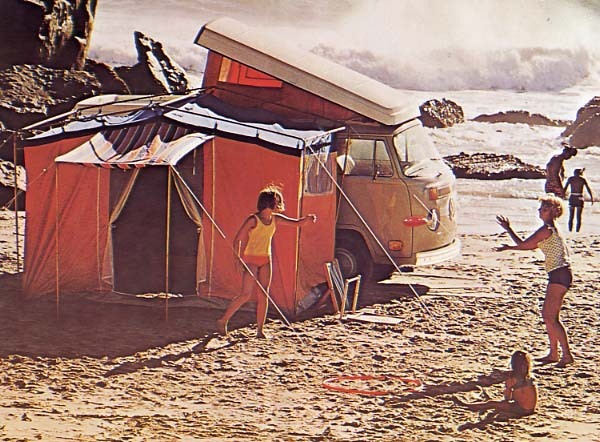 Despite the success of the Campmobile, 1973 was a difficult year for Volkswagen in the Canadian market. 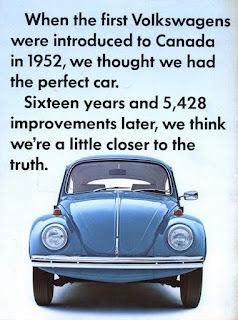 Internal memos from VW Canada show there was a severe shortage of vehicles to ship from West Germany during a large part of the selling season. Equally problematic was the ever-rising Deutch Mark. Currency fluctuation forced the company to hike prices on its vehicles four times during the year. The retail cost of a new Volkswagen rocketed an astonishing 36.2 percent during the year. The twin bugbears prompted sales to slide downward to 31,772 units from 34,511 units in 1972. If there was any comfort at all, competitors fared even less well. With subsidiaries Audi and Porsche figured into the corporate total, VW could still claim the Number Ten spot with a healthy 15.7 percent of the Canadian import market and a 1.2 percent increase overall in domestic sales. This automobile is very useful to mankind. Thanks for this. This car is old now but is very useful. That automobile is already antique. Wow! You were able to preserve it. this volkswagen is so classical and yet until, it is still widely used by many people. I love this old car. I want it preserved.